Some people play gigantic space game Elite: Dangerous to lead humble, (relatively) ordinary space lives. They do missions, make deliveries, and decorate their cockpits with silly little bobbleheads. Then there's The Great Expedition. 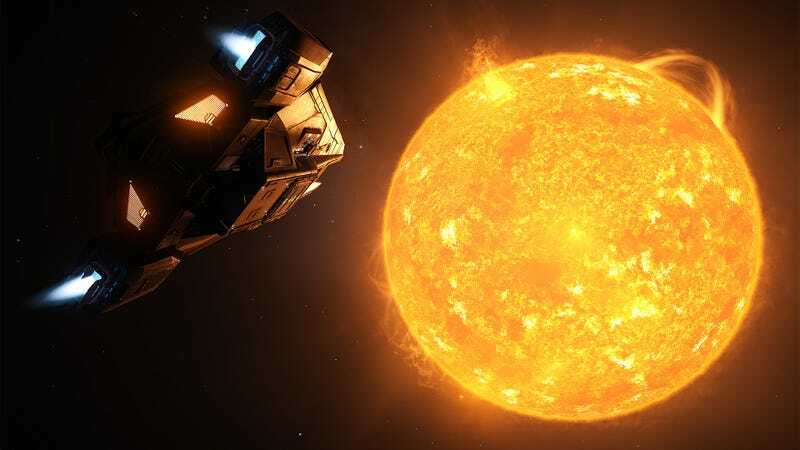 The First Great Expedition began with a single goal: to collectively explore all of Elite: Dangerous' 400 billion star systems—or at least, as many of them as humanly possible. The recently launched space sim contains a massive galaxy modeled after our own Milky Way, its twinkling nebulae knit together by human hands and procedural algorithms rooted in real science. To explore as much of it as they could, some members of this expedition would forsake the rest of the game and just dive into the black unknown. This isn't like in other games, either; traveling back to civilized space isn't as simple as a quick press of a button, nor is plotting routes or figuring out what you're gonna encounter. We're talking thousands upon thousands upon thousands of light years of space. This isn't just a project you knock out on a lazy Sunday afternoon. A little less than a year ago, a gamer named Steve "Gibbonici" Wilds put up a post looking for fellow explorers. At that time, Elite: Dangerous wasn't officially released. In fact, it wasn't even close to presenting a complete, openly traversable galaxy. But there would be space to explore, more than one man could see/catalogue. Wilds expected responses from maybe 15 or 20 people. Instead, he found himself with over 1,000. His team would go on to attract amateur astronomers, astrophysics experts, and one ex-NASA scientist. Members of the Expedition spend their time in the game exploring uninhabited areas in deep space, charting the stars, planets, and pitfalls they find, and relaying information back to other members of the group. Some put in more time than others, some occupy specialized roles, but still, it all goes back to a singular purpose: to see and understand as much of space as possible. "There are some extremely knowledgeable amateur astronomers with us who are keen to visit some of the stellar bodies they've been looking at through their telescopes,"Wilds told me via email, explaining why some people signed up for his Great Expedition into the virtual galaxy. "We've got people who love the idea of playing with others but not in doing the same old guild/corp thing. And there are more than a few who had no interest in exploring at all until they stumbled across us." Exploring, however, is not as simple as pointing your spaceship in one direction, cranking some classic rock, and shouting "yeeeehaw." Planning and logistics are key in a simulation where you have to account for things such as limited resources,overheating spacecraft engines, complex travel routes, and the occasional black hole. The Great Expedition, while not quite as demanding as, say, a major corporation in long-running space game EVE Online, has to be a well-oiled machine. That's important. Virtual outer space is a dangerous place, especially when it's rooted in actual scientific fact, courtesy of Elite's Stellar Forge galaxy generation system. That tech cooks up the game's galaxy by accounting for the chemical composition, gravity, orbits, mass, and actual scientific phenomena we've witnessed in the real Milky Way. "I find myself falling into 'mission planning mode' when I get ready to leave the stations. The frameshift drive/supercruise model in the game doesn't behave like normal orbital mechanics as you would think of with the shuttle (burn the engine on this side of planet to effect an orbit change on the other side), but the planets do have effects on your ship, slowing you down and sometimes 'slingshotting' you around the other side as Kepler's 2nd Law says it must. So, while the tasks are different, the mindset is surprisingly similar [to what I did at NASA]." The Expedition team plotted and planned their charting of the game's galaxy long before Elite: Dangerous' official launch. That enabled them to pre-establish a set of roles for players. Today, there's a core staff of around 10 people responsible for laying down the figurative tracks, or figuring out where people should go. There's also a "wing" system in place to handle issues like scouting and defense as they come up during exploration. In between all the Milky Way derring-do, people are also needed for more mundane tasks like managing base camps—which serve as central meeting points for about a week at a time—and charting progress. Then there's perhaps the most important role of all: the pathfinder. "The main specialist role we run at the moment is the Pathfinders group," explained Wilds. "They're the guys who scout ahead and build up the routes for everyone else to follow. The 'official' Pathfinders group is about eight strong at the moment, but the great thing about explorers is that they tend to be very self-motivating, so we don't have to send anyone out anywhere—they're just doing it under their own initiative." "A few [pathfinders] have been out to the Orion Nebula (spectacular place to visit, nestled at the foot of the Horsehead Nebula with Barnard's Loop overhead—and the Orion stellar nursery is breathtaking), others have been to the 'roof' of the galaxy, and one of our guys, Zulu Romeo, even made it all the way to Sagittarius A*, the black hole at the center of the galaxy. All of these trips people are doing give us a great insight into the travel times and obstacles we'll be facing during the Great Expedition." "I'm troubled by the fact that many of us have lost our interest and maybe even our ability to explore the world around us—not just space, but everywhere," he said. "My fear is that the 'average' player will get in the game and say, 'Oh, another star, another planet. No combat or trade stations? Let's move on.' Frontier has put 400 billion star systems in the game, but unless people are curious about what's out there, very few of those stars will be of interest to anyone. They could just as well have set it in an entirely fictional galaxy, and no one would have noticed. And that, really, is the problem: We aren't curious anymore." At the moment, the main thrust of The Great Expedition—the part where players drop everything for the sole purpose of exploration—hasn't begun. Wilds and co decided to hold off for a bit to wait for Elite: Dangerous to gain some additional features like extra player character slots so people wouldn't have to use their game accounts solely for exploration. That, however, hasn't stopped them from running other big expeditions. The results have been eye-opening, to say the least. There was always a big question looming over The Great Expedition: "Can we actually do this? Is this really feasible at this scale?" The wait, the smaller expeditions, have turned out to be blessings in disguise. "It was a hard decision to take at the time, but it was definitely the right one," said Wilds. "It gives everyone more time to build excellent exploration ships, and it'll give us chance to really nail down all the details of moving, exploring and working as a team. It's amazing how many ideas that sound great on paper actually turn out to be useless when you try them out for real." That also hasn't stopped them from uncovering some wild surprises nestled amongst the stars. "Every few days system maps are being posted on [The Great Expedition] forum showing some really crazy systems," said Wilds. "Some of them have nothing but stars in them, all locked in weird orbits with each other. Others have multiple black holes with all kinds of weird and potentially destructive stuff going on." "For some of us the real surprises come when you're on your way to a nebula or dark region or whatever. You scoop your fuel, then head away from the mainstar to plot your next series of jumps in the galaxy map. Sometimes, when you close the galaxy map with your course plotted, you'll be treated breathtaking view of your target nebula with stars scattered across it like jewels cast over silk, and you just have to take it all in. Screenshots can't do those views any justice at all. They just lose all sense of scale. God knows what they must be like in the [Oculus] Rift." The ex-NASA worker du Verd has found himself pleasantly surprised by how well the game's Stellar Forge adheres to scientific principles, all the way down to little details most players won't even care about. "What I find to carry over more than NASA work is my research in astrophysics," du Verd said. "For example, when I run across a T Tauri star, I expect to find strong stellar winds and a lot of activity on the surface of the star. Another example came up in planning the Expedition itself: Are there stars between the spiral arms that we can use to cross down to the galactic core? The science says there should be lots of dim red stars (since they live a long time) and very few blue stars (since they die comparatively quickly). I was pleased when our early scouts came back and reported that was exactly what they found as they explored coreward. I find that having that background in astrophysics makes it more 'real' than just a game, and that's no small feat." It's hard not to be impressed by what Wilds, du Verd, and the rest of The Great Expedition have achieved so far, but there are still questions. 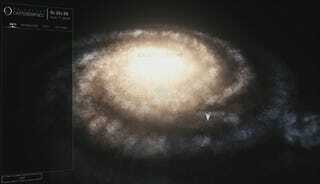 Four hundred billion star systems is, you know, a lot. How long can The Great Expedition last? What if people get bored? "Yeah, that's the question, isn't it?" admitted Wilds. "For all the passion and enthusiasm we've got for this thing, exploration is going to lose some of its appeal six months down the line. There's no getting around that, and it's something we've been conscious of right from the start. You can't start something like this without being realistic about its longevity or being aware that patience is part of the challenge." The hope, then, is that once Elite developer Frontier adds extra player character slots, people will be OK with dedicating one character to The Great Expedition's cause. For now the wait is bittersweet, but according to Wilds it's better than the alternative. "It would be a wasted opportunity if we set off now only for everyone to fly back to civilization after a month," he said. You can't stop explorers from exploring, though. At best, you can only slow them down. Whether blazing a trail through the star-speckled skies as one giant force or a series of smaller groups, The Great Expedition will continue. I wonder what they'll find. Gorgeous exploration videos courtesy of Erimus One and Titus Balls. Screenshot credit goes to The First Great Expedition forums.